For the last month in northeast Los Angeles, the spirit of the buried North Branch creek has been stirring. A series of art and education workshops, culminating in a Creek Celebration on March 21st, were created as the first step in building public support for the daylighting of the North Branch of the Arroyo Seco. Los Angeles has lost the vast majority of its historical wetlands, streams and riparian and aquatic habitat. In Highland Park, the North Branch used to connect springs, hills and meadows to the Arroyo Seco, providing a home for fish, amphibians, birds, and small mammals. Many of these species have now disappeared from the area. Today the stream is a storm drain, running beneath streets and housing. A small stretch of the North Branch could be brought back to life again, to be a home to egrets and tree frogs and a place for people to enjoy. This is the goal of Stream Spirit Rising, a project of Northeast Trees. The events of the last month are the first steps toward this vision of restoration. Jessica Hall of Northeast Trees was the driving force behind it, with support from artist Jennifer Murphy, and the Audubon Center staff, especially Jeff Chapman, Daryl Ramos and Patti Sun. The three Saturday workshops included paper mache mask and puppet making; a nature hike down a streambed; an educational slide show; historical maps; interactive drama games; and storytellers sharing family stories of the North Branch and the Arroyo. The workshops were held at the beautiful new Audubon Center in Debs Park (Montecito Heights). Over the course of three weeks about 50 people took part. Participants ranged in age from 3 to 63. The events concluded with a Creek Celebration last Sunday. 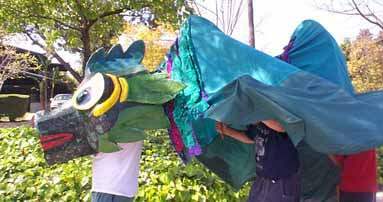 This started off with a parade down part of the old creek bed, with participants wearing Stream Spirit masks and carrying "Slippery", the big dragon puppet. The parade wound it's way into the Sycamore Grove Park, where artists set up installations; local environmental groups had info booths; and speakers, storytellers and bands entertained from the band shell, powered by Solar Sound, a solar energy sound reinforcement system. Performers included Kevin Sandbloom; Mona Jean Cedar and Renee Dominique; Rhyminâ€™ Reason; and Jon Sherman. Site specific artworks by Benjamin Page and Joanne Chase-Mattillo were installed for the day. Many who attended signed letters to Council Member Ed Reyes, County Supervisor Gloria Molina, and Director of Recreation & Parks, John Mukri, asking for funds to be allocated toward restoration of the North Branch. Stream Spirit Rising was funded by lots of volunteer power and a small grant from the Wetlands Recovery Project, a coalition of state, federal and local agencies. The organizers hope that Stream Spirit Rising has begun to activate a corps of wetland stewards who will advocate for daylighting, help do the restoration, and then care for the creek. To find out more, call Northeast Trees at 323-441-8634.